Make the most of your trip to beautiful Gulf Shores by staying in our home away from home. This spacious unit is approximately 1100 square feet with 2 bedrooms and 2 full baths. There are breathtaking views of the Lagoon and beach as you relax inside or on our private covered balcony overlooking the pool and lagoon. Ammenities include full-size washer/dryer in our unit; covered parking; convenient elevator; private pool, fishing pier, and boat launch; covered pavillion with barbeque grills, swing, & rockers. NEWLY COMPLETED BOARDWALK FOR LAGOON LANDING ONTO THE BEACH ! You'll enjoy more privacy and less congestion in our 24 unit complex located on West Beach Blvd. We're only a few minutes from Hwy. 59 and local attractions but away from the crowded public beaches; it's the perfect location you and your family. Make your reservations today as availability is limited. Whether you choose to swim, fish, go boating, shop, or just kick back and enjoy the sights and sounds of the beach, it will surely be a vacation to remember throughout the year! 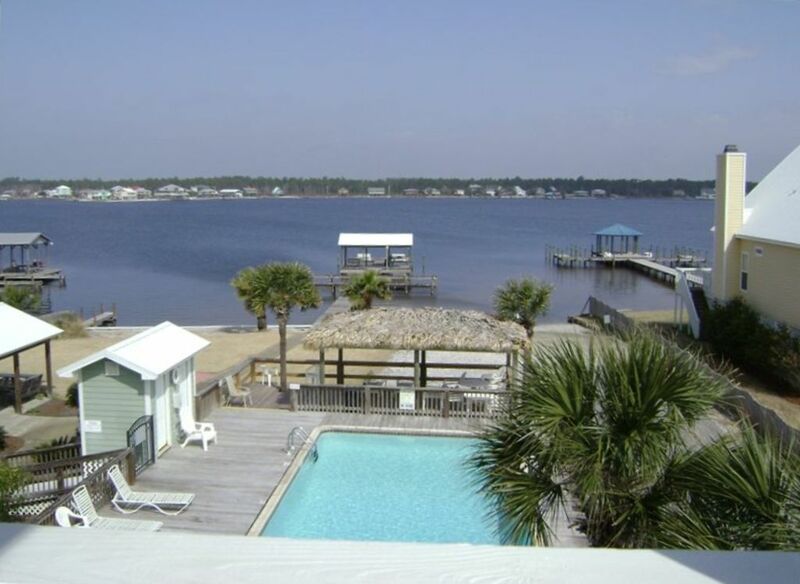 LAGOON LANDING HAS THE BEST OF BOTH WORLDS...BEACH IS ACROSS 2-LANE BEACH BLVD....PLUS WE LOVE THE PRIVATE PIER, BOAT LAUNCH, POOL....COOKOUT FACILITIES W/GRILLS...SWINGS..WOODEN ROCKERS...ONLY 24 CONDOS SO CROWDING IS RARELY A PROBLEM! RENTER MUST BE 25 YRS OF AGE OR OLDER PLEASE ! WE HAVE ADDED WIRELESS INTERNET THIS YEAR! This condo was perfect for our quick 3 night beach trip. The location is amazing...nice lagoon right behind the unit and very quick walk across the street to the beach. The kitchen had everything we needed and there was plenty of space. The condo was clean and neat. Windi was very responsive to questions I had. I loved that she had beach chairs we could use instead of us having to pack and bring our own! Overall, this vacation home was perfect for our stay! Thank you Windi! Unlike many other condo rentals, the owners actually live in this one; and it shows in all of the love, care, and attention you see. We had everything we needed for a perfect family vacation. Even after a very long drive home, the kids are still raving about about how good a time they had! Very nice, comfortable. Great proximity to beach. Close to activities. Thoughtful and friendly owner. We enjoyed it very much. Glad you enjoyed the condo and your visit..love to see you return ! This August we made our 1st trip to Gulf Shores, Al and Windi's home was where we chose to stay. The condo was well equipped and was in a wonderful location. We had everything at our fingertips. We had a challenging journey getting to Gulf Shores and Windi went out of her way to work with us and our situation. Thank you Windi for sharing your home with us as we made 2018 "summer memories ". Loved sharing my condo with you and your family, Karen! I do enjoy knowing that it was a part of your fun vacation - would love to have you return to visit again. I am so glad you enjoyed your stay!...it was a pleasure to host your visit ..hope to see you again soon!